It is generally accepted that the risk of cerebral palsy decreases with increasing gestational age of live born infants. However, recent studies have shown that cerebral palsy often has prenatal antecedents including congenital malformations, vascular insults and maternal infection. Cerebral palsy is therefore better viewed as occurring among fetuses, rather than among infants. We explored the epidemiologic implications of this change in perspective. We used recently published data from Shiga Prefecture, Japan and from North-East England to examine the pattern of gestational age-specific rates of cerebral palsy under these alternative perspectives. We first calculated gestational age-specific rates of cerebral palsy as per convention, by dividing the number of cases of cerebral palsy identified among live births within any gestational age category by the number of live births in that gestational age category. Under the alternative formulation, we calculated gestational age-specific rates of cerebral palsy by dividing the number of cases of cerebral palsy identified among live births within any gestational age category by the number of fetuses who were at risk of being born at that gestation and being afflicted with cerebral palsy. Under the conventional formulation, cerebral palsy rates decreased with increasing gestational age from 63.9 per 1,000 live births at <28 weeks gestation to 0.9 per 1,000 live births at 37 or more weeks gestation. When fetuses were viewed as potential candidates for cerebral palsy, cerebral palsy rates increased with increasing gestational age from 0.08 per 1,000 fetuses at risk at <28 weeks gestation to 0.9 per 1,000 fetuses at risk at 37 or more weeks gestation. The fetuses-at-risk approach is the appropriate epidemiologic formulation for calculating the gestational age-specific rate of cerebral palsy from a causal perspective. It shows that the risk of cerebral palsy increases as gestational duration increases. This compelling view of cerebral palsy risk may help refocus research aimed at understanding and preventing cerebral palsy. Cerebral palsy refers to a heterogeneous group of central nervous system disorders that manifest aberrant control of movement or posture, are present since early in life, and are not the result of recognized progressive disease [1, 2]. The prevalence of cerebral palsy is approximately 1.0 to 2.3 per 1,000 live births . There is a strong inverse relationship between gestational age at birth and cerebral palsy  with rates being several-fold higher among very preterm live births as compared with term live births. Although complications of labour and delivery were previously viewed as the main causal factors, more recent evidence has implicated prenatal factors in the pathogenesis of cerebral palsy [1–5]. The latter include congenital malformations, vascular insults (e.g., those causing prenatal stroke) and maternal infection [1–3]. This emphasis on intrauterine factors led us to question the conventional epidemiologic formulation expressing the gestational age relationship of cerebral palsy. A predominantly prenatal etiology implies that fetuses, rather than live births, are the appropriate candidates at risk for developing cerebral palsy. We explored the epidemiologic implications of this change in perspective by contrasting the patterns of gestational age-specific cerebral palsy rates under the conventional and alternative formulations. We used recently published data from two population-based epidemiologic studies [6, 7] to examine the conventional and alternative propositions regarding the relationship of gestational age with cerebral palsy. The first study from Shiga Prefecture, Japan  documented cerebral palsy rates among 6 year-old children between 1977 and 1991. The second study from North-East England  provided cerebral palsy rates between 1970 and 1994, with cerebral palsy assessment carried out between 4 and 10 years of age . We first calculated gestational age-specific rates of cerebral palsy as per convention, by dividing the number of cases of cerebral palsy identified among live births within any gestational age category (e.g., 28–31 weeks) by the number of live births in that gestational age category (e.g., 28–31 weeks). Under the alternative formulation, we calculated gestational age-specific rates of cerebral palsy by dividing the number of cases of cerebral palsy identified among live births within any gestational age category by the number of fetuses who were at risk of being born at that gestation and being afflicted with cerebral palsy. For instance, all fetuses who delivered between 28–31 weeks as well as fetuses who delivered at gestational ages greater than 31 weeks were included in the denominator for calculating the gestational age-specific rate of cerebral palsy at 28–31 weeks. This implies that a fetus who went on to deliver at term was at risk of being born at 28 weeks gestation and being afflicted with cerebral palsy. Figure 1 provides a schematic depiction of the proposed survival analysis model, with cerebral palsy assigned to the point of birth and survival time censored at birth. Schematic depiction of a survival analysis model for cerebral palsy risk. 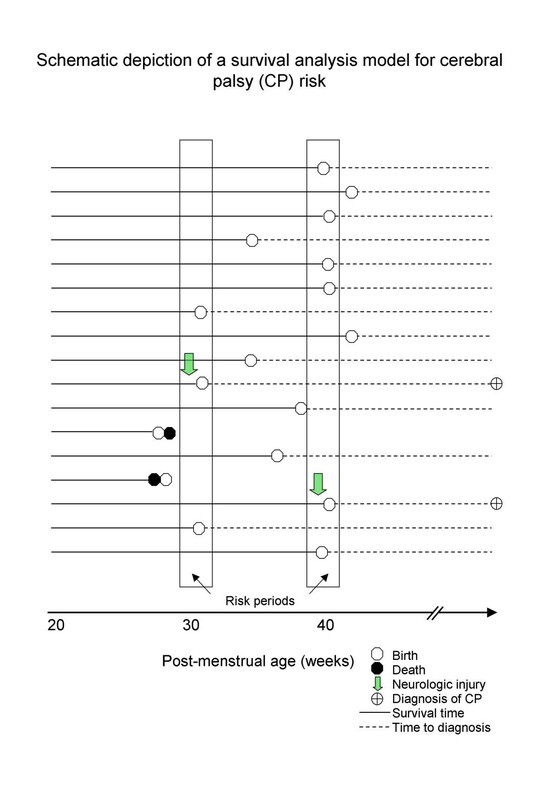 Schematic depiction of a survival analysis model for cerebral palsy risk with post-menstrual age on the X-axis. Two arbitrary periods of risk are shown. In the first risk period, there is one case of cerebral palsy, 3 live births and 15 fetuses at risk, while in the second risk period there is one case of cerebral palsy, 6 live births and 8 fetuses at risk. Under the conventional formulation of gestational age-specific cerebral palsy, this implies a cerebral palsy rate of 1/3 in the first risk period and 1/6 in the second risk period. Under the fetuses-at-risk formulation, the rates of cerebral palsy are 1/15 and 1/8 in the first and second risk periods, respectively. The two formulations of gestational age-specific cerebral palsy rates were graphed and the fetuses-at-risk approach was also used to examine temporal trends in gestational age-specific rates of cerebral palsy in Shiga Prefecture, Japan and in North-East England. Gestational age-specific rates of cerebral palsy declined sharply with increasing gestation under the conventional calculation (Figure 2). On the other hand, rates of cerebral palsy increased dramatically with increasing gestational age when the fetuses-at-risk approach was used (Figure 2). Table 1 shows the numbers of live births, cases of cerebral palsy, fetuses at risk and the two alternative gestational age-specific rates of cerebral palsy in Shiga Prefecture, Japan. Gestational age-specific cerebral palsy rates based on alternative formulations (live births vs fetuses-at-risk). 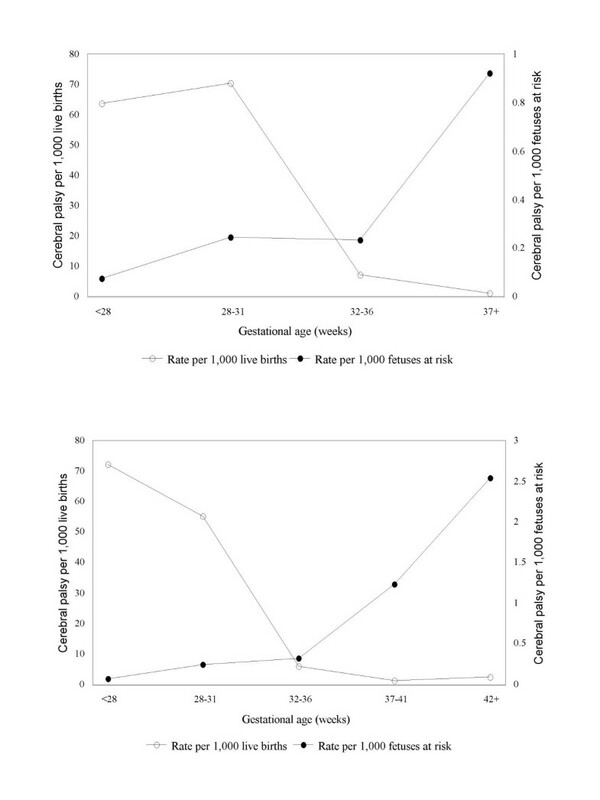 Gestational age-specific rates of cerebral palsy based on live births within a gestational age category (primary Y-axis) and based on the number of fetuses at risk for cerebral palsy (secondary Y-axis), Shiga Prefecture, Japan  (top) and North-East England  (bottom). 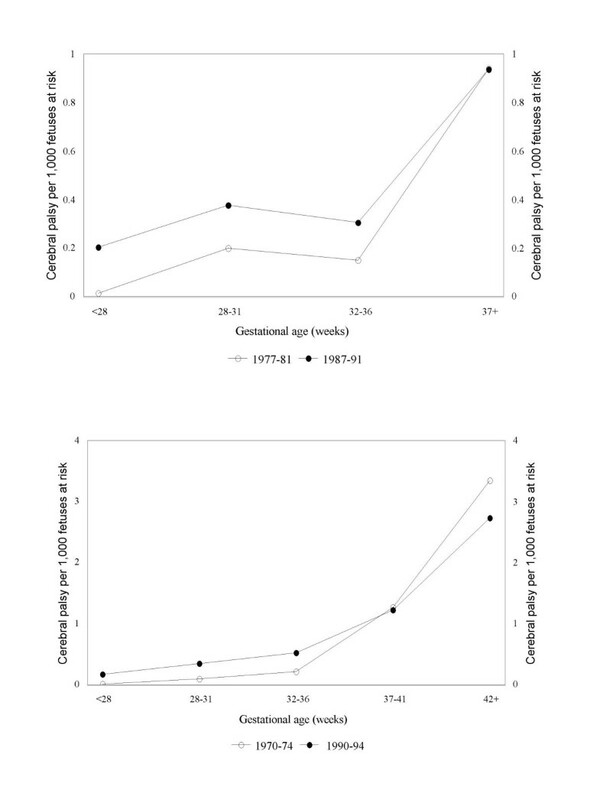 Gestational age-specific rates of cerebral palsy based on live births within a gestational age category and based on the number of fetuses at risk for cerebral palsy, Shiga Prefecture, Japan , 1977 to 1991. † rate per 1,000 live births, calculated using the number of live births within the gestational age category as the denominator. ‡ rate per 1,000 fetuses at risk, calculated using the number of fetuses at risk for cerebral palsy at the particular gestational age as the denominator. ¶ excluding live births with missing/unknown gestational age. Under the conventional formulation, the rate of cerebral palsy was extremely high among live births that occurred at early gestation (63.9 per 1,000 live births at <28 weeks gestation) and low at later gestational ages when most births occurred (0.9 per 1,000 live births at ≥37 weeks). Under the alternative fetuses-at-risk formulation, the rate of cerebral palsy was extremely low at early gestation because of the large number of fetuses potentially at risk for cerebral palsy (0.08 per 1,000 fetuses at risk) and several-fold higher at later gestation ages. The rate at ≥37 weeks gestation (0.9 per 1,000 fetuses at risk) was identical under both formulations (by definition). The increase in the risk of cerebral palsy with increasing gestation under the fetuses-at-risk formulation was a consequence of both a modest decline in the number of fetuses at risk (from 225,786 at 28 weeks to 217,675 at 37 weeks) and a relatively large increase in the number of cerebral palsy cases at later gestational ages (from 55 cases at 28–31 weeks to 201 cases at ≥37 weeks, Table 1). Temporal trends in both the Shiga Prefecture and North-East England showed increases in rates of cerebral palsy at preterm gestation (Figure 3). In North-East England, rates of cerebral palsy appeared to decrease at post-term gestation, although this difference was not statistically significant (p = 0.95). Temporal trends in gestational age-specific rates of cerebral palsy based on the fetuses-at-risk approach. Temporal trends in gestational age-specific rates of cerebral palsy based on the fetuses-at-risk approach, Shiga Prefecture, Japan, 1977–81 versus 1987–91  (top) and North-East England, 1970–74 versus 1990–94  (bottom). The fetuses-at-risk approach for defining cerebral palsy risk shows that cerebral palsy rates increase with increasing gestational age. This represents a compelling view of cerebral palsy risk since it is based on an appropriate identification of the candidates at risk for cerebral palsy. The secular increase in the rate of cerebral palsy at preterm gestation (Figure 2) is well understood and is believed to be a consequence of increases in survival among preterm live births due to improvements in neonatal care . The fetuses-at-risk approach was previously proposed for calculating the gestational age-specific risk of stillbirth [9–11]. More recently, it has been used to explain the paradox of intersecting perinatal mortality curves and other paradoxical phenomena [12–14]. When the fetuses-at-risk approach is used to calculate stillbirth or perinatal death rates, it is observed that gestational age-specific stillbirth [9–11] and perinatal mortality rates [12–14] increase with increasing gestational age. The fetuses at risk approach also shows that cerebral palsy rates increase similarly with increasing gestational duration. Recent recognition of the role of prenatal factors in the etiology of cerebral palsy supports this perspective. The patterns of gestational age-specific stillbirth [9–11], neonatal death [12–14] and cerebral palsy observed under the fetuses-at risk formulation are congruent and the formulation is appropriate because a fetus at any gestation is at risk of birth, death and cerebral palsy at that gestation . Fetuses in adverse uterine environments are at an increased risk of both cerebral palsy and birth. The increase in cerebral palsy risk with increasing gestational age suggests that in a small fraction of pregnancies the uterine environment becomes increasingly compromised as the duration of pregnancy increases. This perspective is also consistent with the high rates of cerebral palsy observed among live births at very early gestation. Very preterm birth is typically the result of a adverse uterine environment, which is in fact also closely associated with the development of cerebral palsy. The traditional formulation of gestational age-specific cerebral palsy risk (per 1,000 live births at any gestational age) represents a non-causal, prognostic model  which is well suited for prediction purposes (with prognosis set at birth). Our alternative formulation of the gestational age-specific pattern of cerebral palsy is important because it represents a causal model which provides insight into a biological process. For instance, under this perspective, the higher rates of preterm birth and the higher rates of cerebral palsy among multiple births are better viewed as the terminal events of an adverse intrauterine process. This is in contradistinction to the conventional view  that "the increase in risk [of cerebral palsy] associated with multiple gestations is chiefly related to the higher rate of premature delivery in such pregnancies...." [, p.1767]. Further, our finding that rates of cerebral palsy increase with increasing gestational age is consistent with and supported by concurrent increases in the rates of several other related perinatal phenomena. For instance, incidence rates of maternal complications such as chorioamnionitis, a known risk factor for cerebral palsy [17, 18], increase as gestational age advances . Similarly, the rate of intra-uterine growth restriction, another risk factor for cerebral palsy [18, 20], also increases with increasing gestational duration [12–14]. Accepting that gestational age-specific rates of cerebral palsy increase with increasing gestation will help to refocus research aimed at better understanding and preventing cerebral palsy. For instance, it would be important to determine if the recent increases in medically-indicated labour induction and/or cesarean delivery at term and post-term gestation [21–23] have resulted in declines in cerebral palsy among fetuses reaching at least 37 weeks gestation. Similarly, recent changes [24–26] in the gestational age distribution of twin and triplet births (eg., preterm birth rates among twins in the United States have increased from 41% in 1981 to 55% in 1997 due to increases in labour induction and/or cesarean delivery ) may have resulted in declines in cerebral palsy rates. Under the fetuses-at-risk formulation, a decline in cerebral palsy rates would be the expected consequence of the recent increases in labour induction and/or cesarean delivery, if the obstetric intervention preceded not only the onset of spontaneous labour but also the point at which critical neurologic injury occurred. Note that under the traditional formulation of gestational age-specific cerebral palsy rates [1, 16], increases in cerebral palsy would be the expected consequence of the iatrogenic increase in preterm birth rates among twins and triplets [24–26]. However, such research into the effect of recent increases in obstetric intervention needs to account for potential increases in cerebral palsy rates which may have occurred secondary to secular improvements in survival i.e., the focus cannot be on cerebral palsy alone but on death (including stillbirth and infant death) and cerebral palsy. Other challenges include the need for addressing temporal changes in methods of gestational age ascertainment (menstrual-based versus ultrasound-based). The categorization of gestational age into intervals of unequal duration (based on the categories in the published literature [6, 7]) represents a minor limitation of our characterization of gestational age-specific rates of cerebral palsy. This limitation (8 week period of risk between 20–27 weeks, 4 weeks between 28–31 weeks, 5 weeks between 32–36 weeks and 6+ weeks between 37 and 42+ weeks gestation) does not compromise the general pattern of gestation age-specific cerebral palsy risk, however. Similarly, a small approximation is involved in our estimates of the number of fetuses at risk since the original publications [6, 7] did not provide gestational age-specific counts of stillbirths. The calculation of the number of fetuses-at-risk for the data from North-East England also excluded neonatal deaths since the original publication provided information on neonatal survivors only . Nevertheless, the pattern of gestational age-specific cerebral palsy from Shiga Prefecture and from North-East England are similar (Figures 2 and 3). This is because the losses (deaths) are small relative to the size of the denominator (fetuses-at-risk). A potential limitation inherent in our survival analysis model (Figure 1) arises because cerebral palsy is assigned to the point of birth. Whereas this representation is ideal for cerebral palsy due to complications of labour and delivery and cerebral palsy occurring in the period immediately preceding birth, the method will systematically overestimate the gestational age at which neurologic injury occurs if cerebral palsy occurrence substantially precedes birth. The gestational age-specific pattern of cerebral palsy risk will not be seriously affected by this bias, however, given its systematic nature. Furthermore, it is probable that in many cases the adverse intrauterine environment which causes the critical neurologic injury also leads to labour i.e., critical neurologic injury and birth occur in close temporal proximity. Cases of cerebral palsy where the cause occurs after birth are not a serious concern given the relative rarity of such events and because such cases can be identified and excluded (as done in North-East England ). Recent evidence, which suggests that cerebral palsy has a predominantly prenatal etiology, implies that fetuses at any gestation (rather than live births at that gestation) constitute the epidemiologically appropriate denominator for calculating gestational age-specific cerebral palsy rates. This leads to an alternative formulation of gestational age-specific cerebral palsy rates (i.e., the fetuses-at-risk approach), which shows that cerebral palsy rates increase as gestational age increases. The biological and epidemiologic perspective that emerges from this reformulation may help refocus research efforts aimed at better understanding and preventing cerebral palsy. The traditional formulation of gestational age-specific cerebral palsy rates is better viewed as a non-causal model which is appropriate for prediction/prognostic purposes. Dr. Joseph is supported by a Clinical Research Scholar award from the Dalhousie University Faculty of Medicine and a Peter Lougheed/CIHR New Investigator award from the Peter Lougheed Medical Research Foundation and the Canadian Institutes of Health Research. KSJ proposed the study, carried out the preliminary analyses and wrote the paper. All authors discussed the analyses, contributed to the intellectual content of the paper and approved the final version. KSJ provided the general medical and epidemiologic input, ACA, SL and MJV provided the neonatal-perinatal perspective, LM-K provided the maternal-fetal medicine perspective and MJV and EW contributed expertise from a developmental/pediatric neurology standpoint.